He's Africa's most wanted man and the leader of the feared Lord's Resistance Army. 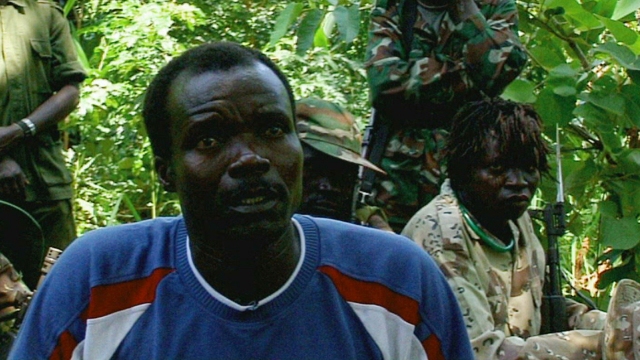 In his first interview for over twenty years, Joseph Kony explains why he's fighting. ""I am a freedom fighter not a terrorist"," proclaims Joseph Kony. ""We are fighting for total democracy."" It''s a surprising statement from a man widely believed to be a mad fantasist fighting for God. It''s taken nearly a year of negotiations for Kony to agree to this interview. In his jungle hideout in the DRC, he seems relaxed and at ease. He weighs up each question with consideration and is surprisingly articulate. ""The LRA has never been involved in any abductions, rapes or mutilations. That''s just Museveni''s propaganda."" Perhaps mindful of his reputation, Kony denies suggestions God told him to fight. He does, however, admit to being guided by "very many spirits." And Vincent Otti, his number two states: ""We are fighting to defend the 10 Commandments."" It''s believed Kony is about to begin peace talks with the Ugandan government. He''s been following the case of former Liberian leader Charles Taylor with interest. But Kony himself has no fear of an international tribunal. As the VP of South Sudan states: ""If we can bring about a peaceful settlement, the legal process can be done later.""